How can you help protect the river? How can you explore it? Download the Water Watcher app for free on the Apple and Google Play stores! Especially with reference information, like recreation access points and lake levels, this is an app that can be enjoyed by boaters, kayakers, and citizens interested in protecting our waterways whether they are on our river and its lakes or inland around the creeks that feed the main stem. We have a unique asset in our vast network of trained volunteers and concerned citizens, the majority of whom now have smartphones. The Water Watcher app helps people explore and fall in love with this river as well as make it easier and more efficient to get pollution documented and reported. 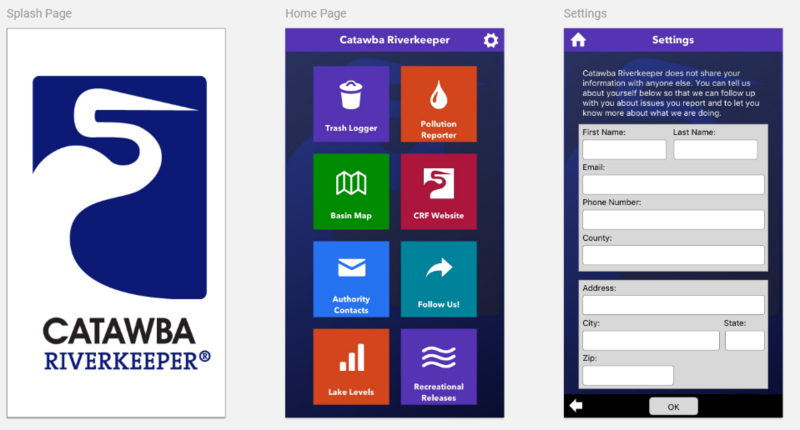 Search in your phone’s app store for “Catawba Water Watcher” and download. Upon first opening the app, you will be asked to fill out contact information. We use this information to auto-fill various fields in the reporting tools so we can follow up with you! On the home screen, you will find eight tools, as well as a settings (gear) icon in the top-right with information and the ability to change your contact info. Use it! Details on tools are provided below. We get a TON of trash out of the Catawba River, its lakes and the waterways that feed it. Actually, we clean up about 25 TONS each year. We are doing more cleanups than ever, but our sites with annual cleanups (e.g., the lakes) have done such a great job cleaning up legacy trash, we sometimes have trouble FINDING trash for people to get. At the same time, we might hear after a cleanup that we missed trash. So, help us find trash to target at our next cleanup! Tap on the Trash Logger tile. Fill out fields for describing the trash. The GPS location will automatically be logged. On the next screen, you can even take pictures of the trash to include in the log. Finally, submit it to us! This works the same way as the Trash Logger. We have detailed questions (some required) but really need this info! What is where? Explore the basin! Take time to play with this one. The squares at the top allow you to change base maps (e.g., aerial imagery, streets) and turn on/off certain layers (recreation access points, permitted pollution discharges, waterways, sub-drainage basin lines, legislative districts, and MUCH MORE!). Browse our website from the app. Join the 700 members throughout the basin that make our advocacy, education and protection work possible! We are a 501(c)(3), tax-deductible nonprofit with five full-time employees working over 5,000 square miles. We are primarily funded by our memberships. Join for as little as $5/month! If you want to contact an enforcement agency, this is your Rolodex with contact information. If you have been through one of our Water Watcher or Coverkeeper courses, you’ll have a pretty good idea about whom to contact about an issue. If you are unsure, submit your documentation through our Pollution Reporter! Daily updates from Facebook, Instagram and Twitter are all in one place here. To comment/like/share, you will have to log in to each one but will remain logged in. Lake seem high? Low? Check in an instant! This includes both actual elevation and the federally regulated target elevation. Planning a kayak, canoe or tube trip? Need to know when the dams are releasing water? This will be a popular tool particularly in the summer! You can also click on the dam to get information about when flow will arrive where downstream. Make sure you fill out all fields. Some are required. We really need these details, we promise! Ensure your phone’s GPS (location) is turned on and that the app is allowed to access it. At some point, you will be prompted for permission. If you find any errors or bugs — or if you have a great idea for something to add! — please contact us at crf@catawbariverkeeper.org. This app is for YOU! We appreciate your support that makes such an app possible! If you are not a member and appreciate our providing you with an app like this, information on issues and our overall work to keep clean the water we all depend on and enjoy, please do join today! We cannot thank enough web and mobile development company Shiny Creek in Asheville. Their president actually used to live on and enjoy fishing the free-flowing Catawba River. We were very fortunate to have Shiny Creek work with us to make this possible! If you have any web or mobile development needs, visit ShinyCreek.com.